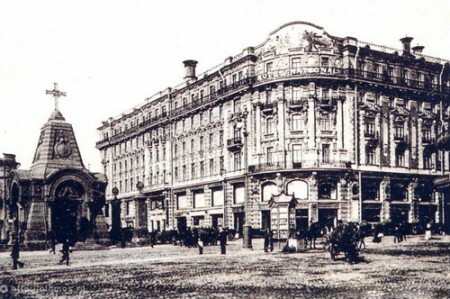 The National hotel is a historical hotel in the center of Moscow. It was built by the famous Russian architect Alexander Ivanov in 1903. It accommodated foreign diplomats, famous performers, business tycoons. Decorated with stained glass windows, exceptional paintings and exclusive art objects National became one of the most luxurious hotels in the city. To the left of the hotel we see a chapel. Alexander Nevsky chapel was built in 1883 in memory of the Russian-Turkish war. The chapel was demolished in 1922. It was the first Moscow church destroyed by the Soviet government. After 1917, the National was nationalized. 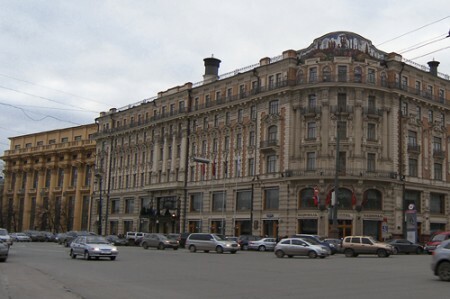 It was proclaimed the First House of the Soviets and became a residence of the Bolshevik government. Many top communist leaders lived here including Vladimir Lenin. The National hotel today is one of the oldest hotels in the city. It attracts the visitors with its elegance and luxury.